On November 13, 2018, the “Working Committee Warm Edge” met for a meeting in Rosenheim, to celebrate a special occasion: In November 2018, the founding of the working group celebrated its 20th anniversary. Reason enough to look once upon the success story of this active BF working group (BF= Bundesverband Flachglas, German Federal Flat Glass Association). Hour of birth of the WG Warm Edge was the BF Symposium on November 11, 1998 in Troisdorf on the subject “Thermally insulating edge bond systems”. There, the idea arose to jointly think about a fair, correct comparison of the spacer systems. For the younger among the readers it should be noted that at that time, windows in Germany were declared with kF values, without taking the thermal bridge at the edge of the glass into account. Warm edge provided no benefit for the kF value, the European standardization was not yet introduced. Right at the first meeting of the WG on January 27, 1999, a project for the definition of uniform measurement and test criteria for Warm Edge was started, in which the six participating warm-edge systems were calculated under the same conditions at ift Rosenheim. Other projects followed, including the research project Psi-values windows with funding by the DIBt (German Centre of Competence for Construction) and the participation of five calculating and three measuring bodies, in which calculations were compared with measurements and extensive basics worked out. Many projects of the WG Warm Edge subsequently found expression in the standardization. 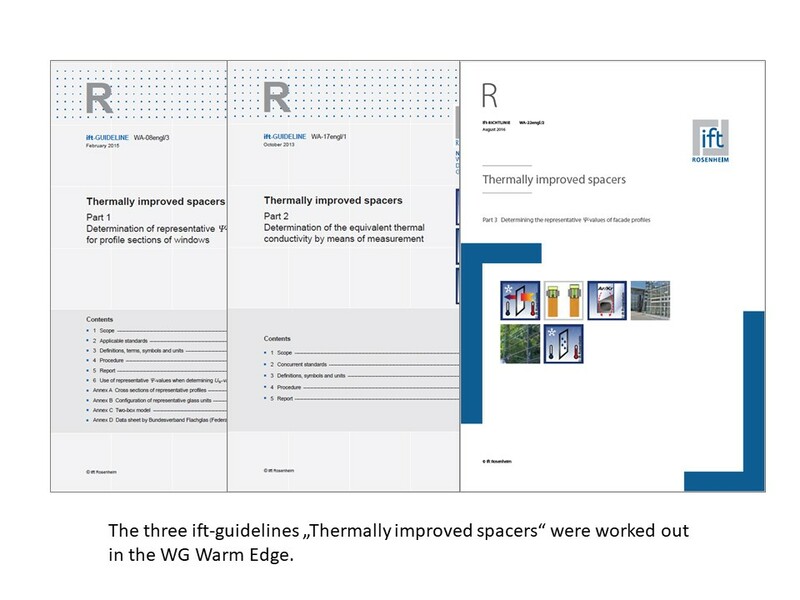 This includes the definition of “thermally improved”, which can be found today in EN ISO 10077-1 and in the standard for calculating the thermal transfer coefficient of facades, EN ISO 12631. Best known and most popular are the datasheets produced by the Working Group Warm Edge, published by the BF, with representative Psi values for windows and for facade profiles – generally known as the “BF Datasheets”. (Here you can download the datasheets for windows and for facade profiles). They allow window and facade manufacturers to save the hassle of calculating Uw and Ucw values with a detailed FEM simulation and still be able to take full advantage of the value advantage of Warm Edge. The datasheets are in use in many countries worldwide. 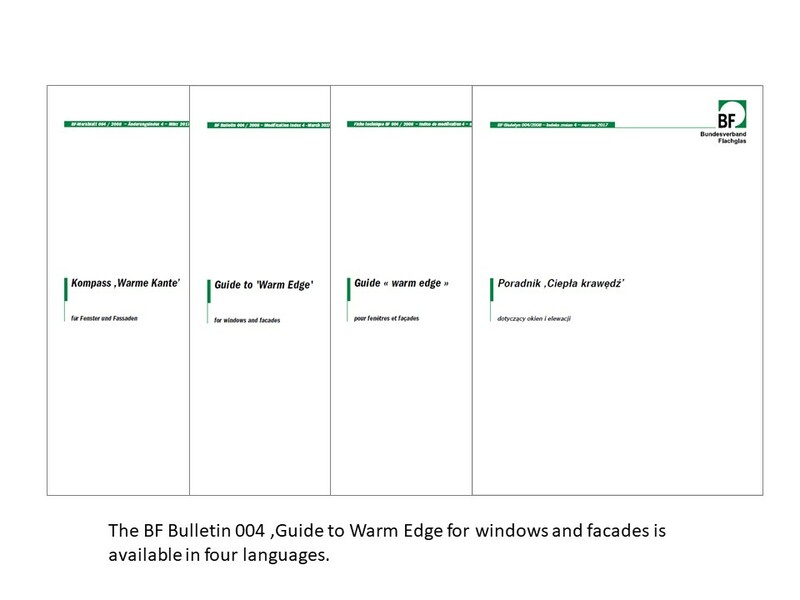 Together with the BF Bulletin 004 “Guide to ‘warm edge’ for windows and facades” they are now available on the BF homepage in four languages (download of the BF Bulletin here). Warm edge is indispensable to the market of today. Nevertheless, the WG does not see itself at the end of its activity. “We still have many ideas!” says Ingrid Meyer-Quel, spokeswoman for the working group: “At the moment we are working on a larger project with the topic, what else has to be performed by a spacer in insulating glass. After all, the best thermal improvement will not do any good if one-sided optimization leaves other important functions behind. “For the safety of processors and users of Warm Edge, quality criteria for usability should be defined and measurement methods developed. You can look forward to the next twenty years. The Warm Edge Working Party is a subcommittee of the Technical Committee of Bundesverband Flachglas. The participants in the working group are members and sponsoring members of the BF. Scientific support for the working group is provided by Mr. Norbert Sack, ift Rosenheim. This article was a press release of the BF in January 2019.